"Dumped items can be quickly removed to avoid further fly tipping"
Along with our core services, we also offer several additional services to meet all of your needs. 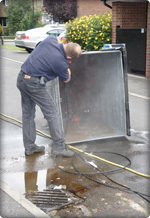 A range of surfaces can be cleaned using our high powered pressure wash system from block paving to the inside and out of waste bins. The power of our pure water system easily cleans even the dirtiest of painted or UPVC cladding. Many hard flooring materials that have been neglected can be rejuvenated using the expertise, machinery and materials that we have. This modern day plague can be removed successfully from a variety of surfaces. We can remove all fly tipped or dumped items including those that require special licences such as refrigerators. Each invoice for this type of work is supplied with a before and after picture. We can take the most overgrown garden and after clearing can deliver something that you will be proud of and that we can maintain to a very high standard. Our commercial extraction or steam cleaning carpet machines can provide excellent results, making your carpet look as good as new. An air fragrancing system using natural hypoallergenic oil tablets which will take away the unavoidable odours often found on communal stairs and landings. These small battery operated machines can make a huge difference to the ambience of internal communal areas.